Illustrated on the first few pages are ladies’ suits. One of these is a velvet suit, shown below on the left. According to its description on the opposite page, it had a flared skirt and a semi-fitted coat flared below the waist. The coat was lined with satin and fastened with velvet buttons and loops. Priced at $32.95, it was available in several colors–wine, plum, black, or green. Bellas Hess & Co., New York, NY. Fall and Winter Catalogue No. 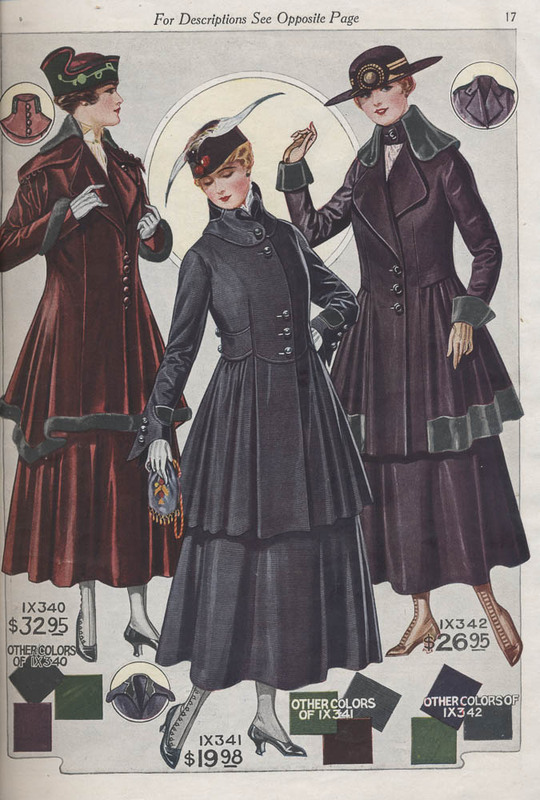 74, 1916-1917, page 17, Ladies’ suits. Velvet suit described above is shown on the left. 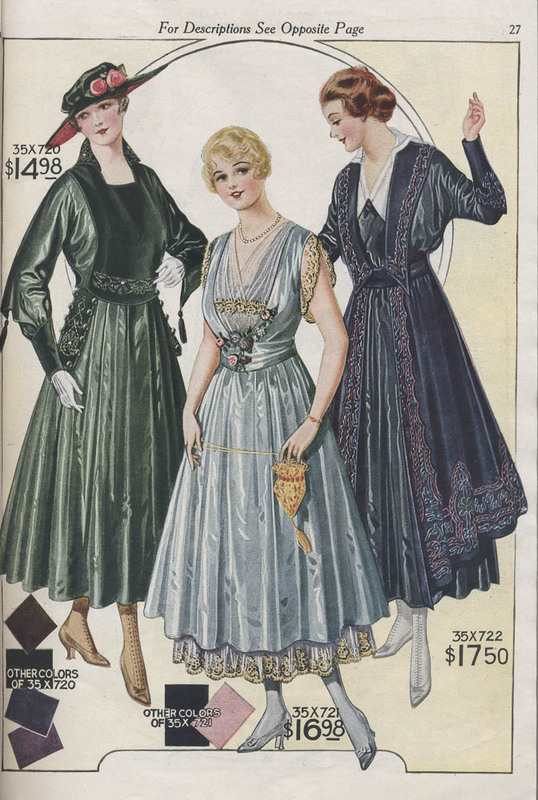 The catalog also illustrates dresses and evening gowns. The evening gown shown below, in the middle, was made of Satin Charmeuse. As described on the opposite page, “the corsage has a surplice drapery of Brussels net with a touch of net embroidered in gold and pastel colored threads, and a spray of pastel rose buds and velvet foliage.” The sleeves matched the front and were made of gold embroidered net. There was a cluster of rose buds at the waist, and the skirt fell in “full graceful folds” with a ruffle of gold embroidered net at the bottom. It was priced at $16.98 and available in light blue, pink, or black. Bellas Hess & Co., New York, NY. Fall and Winter Catalogue No. 74, 1916-1917, page 27, dresses. The evening gown described above is shown in the middle. 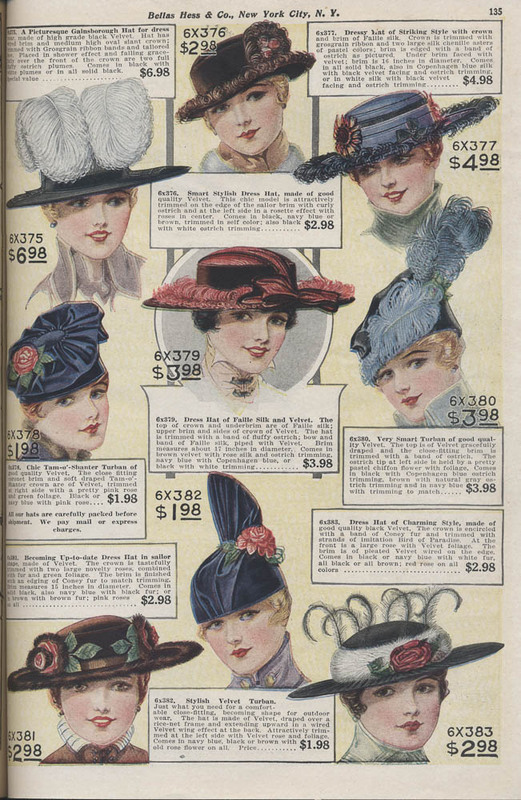 Also advertised in this catalog are hats. Some are trimmed with roses and green foliage while ribbon or ostrich plumes decorate others. Many of the hats illustrated below have one thing in common–velvet. Bellas Hess & Co., New York, NY. Fall and Winter Catalogue No. 74, 1916-1917, page 135, hats. Fall and Winter Catalogue No. 74 is located in the Trade Literature Collection at the National Museum of American History Library. Interested in more fashion from the 1916-1917 seasons? Take a look at Galaxy of Images for more pages from this catalog. Previous Post Get ready for Fashion Week! I have an eleven year old child doing drama. She needs an outfit from the the year 1916. I would great appreciate if you are a stockist of these outfits and the price range. Unfortunately, we do not have replicas of the clothes. We merely have a copy of the 1916 catalog in which they were featured. We hope it provides you and your daughter with some inspiration!